Synthetic peptide within Human AKT3 aa 450 to the C-terminus (phospho S472). The exact sequence is proprietary. WB: MCF7 whole cell lysate treated with 100ng/ml IGF-1 for 15 minutes; PC-12 and NIH/3T3 whole cell lysates treated with 100ng/ml PDGF for 60 minutes. ICC/IF: NIH/3T3 cells treated with PDGF (100 ng/ml) for 1 hour. IP: NIH/3T3 treated with 50ng/ml PDGF for 40min whole cell lysate. Our Abpromise guarantee covers the use of ab222489 in the following tested applications. WB Use at an assay dependent concentration. Detects a band of approximately 56 kDa (predicted molecular weight: 56 kDa). Dot blot analysis of AKT3 (phospho S472) labeled with ab192623 at 1/1000 dilution. Lane 4: AKT2 (phospho S474) phospho peptide. This data was developed using the same antibody clone in a different buffer formulation containing PBS, BSA, glycerol, and sodium azide (ab192623). Immunofluorescent analysis of 4% paraformaldehyde-fixed, 0.1% Triton X-100 permeabilized NIH/3T3 (Mouse embryonic fibroblast cell line) cells, untreated or treated with PDGF (100 ng/ml) for 1 hour, labeling AKT3 (phospho S472) + AKT2 (phospho S474) + AKT1 (phospho S473) with ab192623 at 1/100 dilution, followed by Goat Anti-Rabbit IgG (Alexa Fluor® 488) (ab150077) secondary antibody at 1/1000 dilution (green). The signal increased after treatment with PDGF (100 ng/ml) for 1 hour on NIH/3T3 cells. 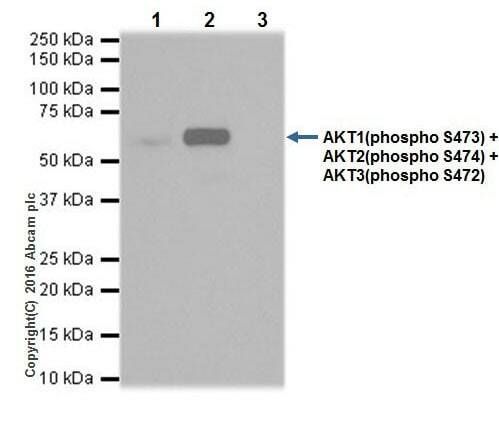 AKT3 (phospho S472) was immunoprecipitated from 0.35 mg of NIH/3T3 (Mouse embryonic fibroblast cell line) treated with 50ng/ml PDGF for 40min whole cell lysate with ab192623 at 1/40 dilution. 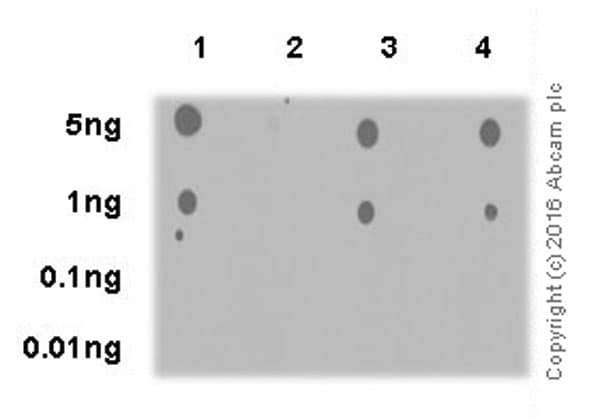 Western blot was performed from the immunoprecipitate using ab192623 at 1/500 dilution. 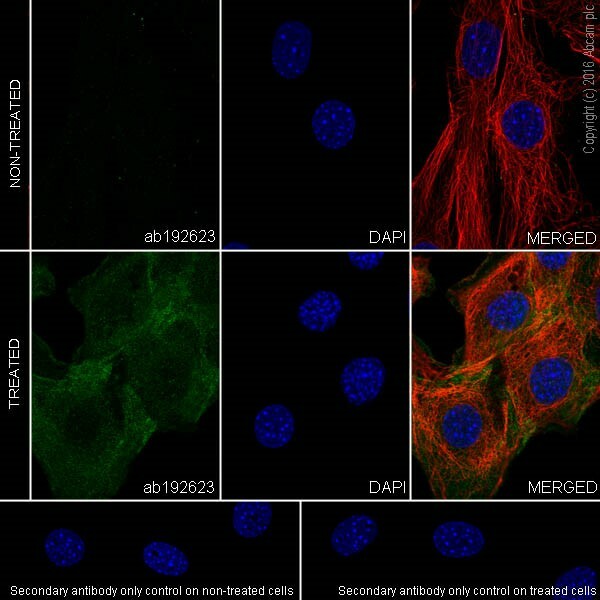 VeriBlot for IP secondary antibody (HRP) (ab131366), was used as secondary antibody at 1/1000 dilution. Lane 1: NIH/3T3 treated with 50ng/ml PDGF for 40min whole cell lysate, 10μg (Input). Lane 2: ab192623 IP in NIH/3T3 treated with 50ng/ml PDGF for 40min whole cell lysate. Lane 3: Rabbit IgG,monoclonal [EPR25A]-Isotype Control (ab172730) instead of ab192623 in NIH/3T3 treated with 50ng/ml PDGF for 40min whole cell lysate. ab222489 has not yet been referenced specifically in any publications. 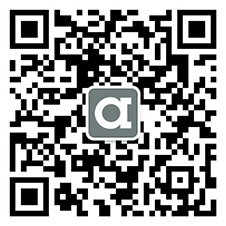 There are currently no Customer reviews or Questions for ab222489.